We had a nice family day. We stocked up at the farmer's market since we haven't been able to make it every week. We came home for lunch and naps. 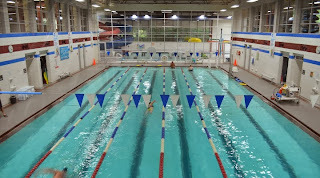 Then we went to the YMCA for a swim. Ayden has always loved water but something has really clicked since we've started our new membership. He is so excited to go swimming, is so brave in the water and kicks his little feet as hard as he can while we glide him across the water. On our way out we picked up a pamphlet with information on swim lessons. The prices are affordable and we are considering trying out an 8 week session. For Ayden's age group the lessons are family based so we would be in the water with him so we'd be learning tips and tricks for teaching him to swim that we could continue after the lessons were over. I didn't learn to swim until I was 9 or so and taught myself after I had a scare in a pool. Ever since, I always wanted to make sure my children were confident, and more importantly, safe in water from a very early age. The only other issue to consider is our problem with hyper-scheduling our weekends. His lessons would be on Saturday mornings when we are already spread pretty thin most of the time. I suppose if we made time to swim this evening, we could just shift things around for 8 weeks and go in the morning instead... It's always about finding and maintaining that balance, a never ending endeavor. We got home around 5:30, had dinner around 6:30, got Ayden a bath and started our bedtime routine. Things are going really well in that department and I do plan to share all about it once we know for sure everything is going to stick. Our quality of sleep has definitely been improved the passed couple of nights so even if it doesn't stick, I'll call it a success! Did you put your toddler in swim lessons? Was it worth it? Flashback! Here's what we were up to one year ago today: "11 Months Old!"